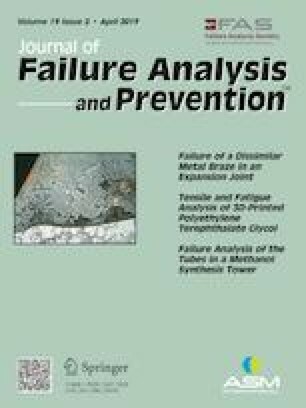 This study involves the failure analysis of carbon steel tubes in a reformed gas boiler feed water preheater unit operating at an ammonia plant. It was determined that the incipient failure mechanism in the carbon steel tubes was pitting corrosion at the inner surface of the failed tube transporting boiler feed water. The spectroscopic and microscopic analysis revealed the presence of iron oxides, including magnetite (Fe3O4), on the surface of a hole inside a pit formed in the inner surface. A significant thickness reduction in the internal wall due to subsequent erosion–corrosion led to the formation of the hole. No voids/cracks were present in the grain boundaries in the (ferritic and pearlitic) microstructure of the carbon steel tube (A214). Due to the recurrent nature of the failure of the carbon steel tubes in the preheater unit, SS304L tubes are recommended to be used throughout the waterside of the preheater. The authors would like to acknowledge the support of Industrial Plant Services Limited in performing this study.